Forget Type As and Bs. The future lies with Type Rs — the individuals, leaders, businesses, families, and communities that turn challenges into opportunity in times of upheaval, crisis, and change. 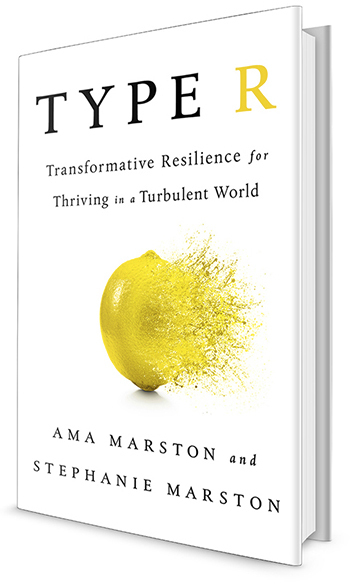 In this thought provoking book Ama Marston, an internationally recognized strategist and thought leader focused on Transformative Resilience and purpose-driven leadership and business, teams up with her mother, psychotherapist, stress and work-life expert, and corporate consultant Stephanie Marston. Together they explore the process of Transformative Resilience. And, they look at the mindset, skills, and strategies of Type Rs who are finding ways to turn some of the most challenging of circumstances into opportunity — growing from the experience and springing forward rather than merely bouncing back — and ultimately making a contribution to the world. In Type R, their research spans the personal and professional, the local and the global, combining each of their unique professional insights while reaching across psychology, neuroscience, the natural sciences, business, and politics, among other disciplines. And they share inspiring stories that highlight the complexity of the times we live in — unprecedented world events, environmental crises, and businesses facing increasing global competition as well the individual and collective triumphs of Type Rs coping with these as well as the stress of daily life, unstable careers, and the challenges and disruptions that will inevitably rattle our lives at some point.